BU received its first commitment from a 2002 birthdate as dual-citizen Dylan Peterson from the Canada International Hockey Academy Major Bantams verballed for 2020. A 6’2, 169 lb., right-shot power forward born in Chicago, Peterson has 15 points in nine games for the CIHA AAA Bantams and serves as assistant captain. He joins Avon Old Farms forward Trevor Zegras in the Terriers' 2020 recruit class. #82 Dylan Peterson for the E.O Wild Minor Bantam team is an electrifying player to watch. A gifted, natural athlete, Dylan can mesmerize his opponents with his puck possession skills as well as "blow them away" with his blazing speed. Along with his speed and offensive skills (video-he’s #24), Peterson also has a bit of Nikolas Olsson to his game (#82 in red). Earlier this month, Peterson was the leading scorer at the Boston Pizza Peterborough Bantam Icefest, with seven goals and three assists in five games, leading the Voyageurs to the quarterfinals. Playing in the 2015 Mini Chowder Cup in Boston for tournament champion Rink Eye Selects, he had a 5-6-11 line in four preliminary round games and 2-2-4 in two playoff games, trailing only 2019 BU recruit Robert Mastrosimone. 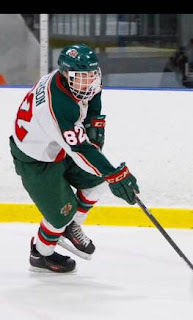 "Dylan Peterson, F, Eastern Ontario Wild – Big right-shot power forward with finesse. Has soft hands, and showed creativity and hockey IQ." ►Kirk Ludeke’s ScoutingPost blog offers a prospect update on Bruins draft pick Jakob Forsbacka Karlsson. Forsbacka-Karlsson is doing all of the little things that coaches at all levels love and value: production, smart three-zone play, effectiveness in the faceoff circle, and a mature, quiet style of leadership. ►The Hockey News’ Prospect Need to Know turned its spotlight on freshman goalie Jake Oettinger. 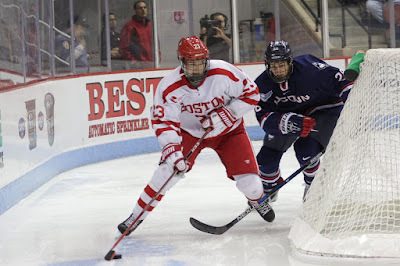 And a Hockeysfuture.com reader posted some Oettinger highlights from the Sacred Heart game. 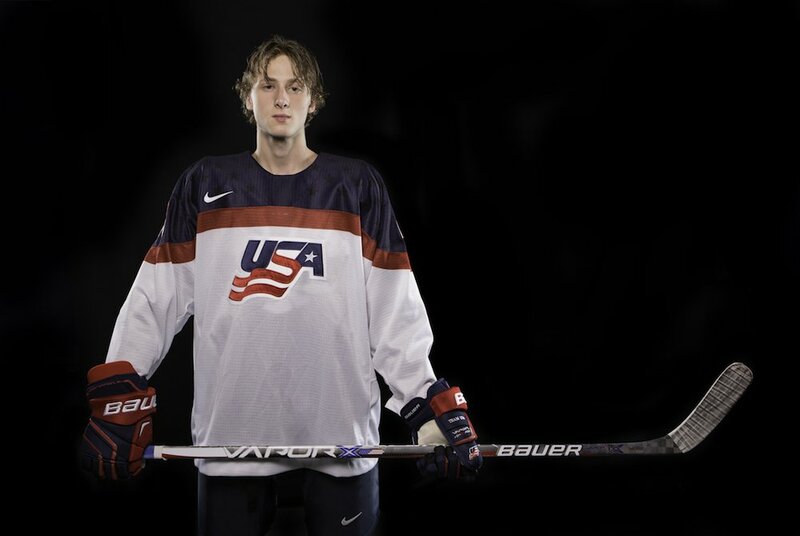 2018 recruit Tyler Weiss tried BMX biking and basketball before finding his passion in hockey. The North Carolina native, who played for the gold-medal winning Team USA in the 2016 Youth Olympic Games, is tied for second on the NTDP U17s with seven points (1G, 6A). Charlie Coyle's third goal of the season was the game-winner as the Minnesota Wild blanked the Bruins, 5-0. The former Terrier grabbed his own rebound to score on a spin-a-rama for his first-ever goal against Boston. 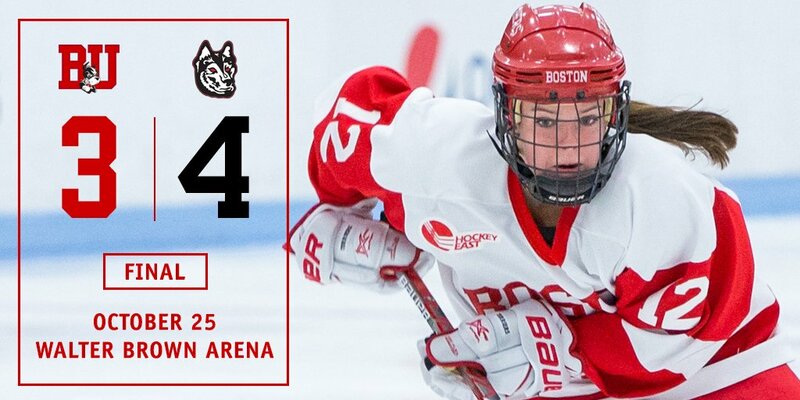 Terriers dropped a 4-3 decision to Northeastern at Walter Brown Arena as a third-period rally fell short. BU fell behind, 2-0, just six minutes into the game before senior Maddie Elia put the Terriers on the board at 11:48. 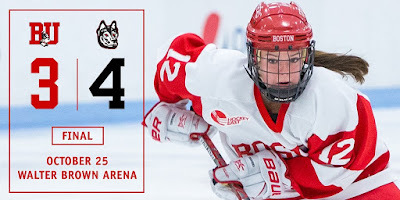 The Huskies used power play and short-handed tallies to expand the lead to 4-1 in the second period before junior Victoria Bach’s power play goal late in the period, reduced the margin to two. Bach scored again early in the third period, but Northeastern kept BU from scoring an equalizer. Senior Victoria Hanson made 36 saves for BU.